Algae and commercial aquatic feed developer World Health Energy Holdings signed a letter of intent with Prime Inc. India to develop a proposed biodiesel production facility in India that would ramp up to 250 acres with a budget of up to $100 million. As expected, the EPA set the 2012 biomass-based diesel standard at 1 billion gallons, and mentioned that the agency is still considering the proposed 2013 volume of 1.28 billion gallons. EPA says it will make a final decision on this next year. Lee Enterprises Consulting of Little Rock, Ark., the world's largest biodiesel consulting group, recently announced its plans for expansion in 2012, which include broadening the group's services into ethanol, biomass, wind, solar and geothermal. The change removes the TxLED (Texas Low Emission Diesel) requirement to use additional additives with biodiesel and reduces reporting requirements for blenders that have stymied biodiesel sales and use in the state's nonattainment zones for years. NBB vice president of federal affairs Anne Steckel says, "Jobs and the economy are supposed to be the top priority in Washington, yet Congress has left thousands of workers in limbo heading into the holidays by failing to extend this tax incentive." Natural Resources Canada is making a six-year, $31 million investment in Kyoto Fuels Corp. through its ecoENERGY for Biofuels program. The Alberta facility expects to produce 66 million liters of biodiesel annually and will use multiple feedstocks. In its December report, the AOF stated that 2.946 million metric tons of canola has been harvested this year. The previous record set in 1999 was 500,000 tons less. The organization also reported that prices have remained stable at $450-$490/ton. CARB voted to introduce changes to the regulation that improve how the LCFS regulation accounts for the carbon intensity of crude oils. The amendments would require that the carbon intensity of crudes be fully accounted for, just as with biofuels. Congress appears to be at an impasse over legislation to extend the payroll tax break, and no action is likely on extensions of other tax incentives. 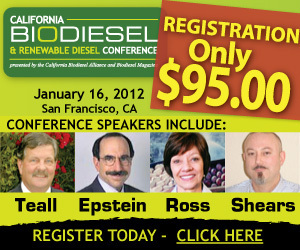 On a bright note, a draft package of tax extenders, including the biodiesel credit, was circulating.